When it comes to Vacation Scheme and Training Contract applications, most law firms use an application portal with Apply4law being the main one. If you are completing a Vacation Scheme or Training Contract application through Apply4Law, it's important for you to know the key sections to focus on, what information law firms are looking to see and for you to make no mistakes when completing the application. The first page simply asks if you've met, or expect to meet, the minimum entry criteria. Tip: Make sure this information matches the grades you will enter later in the application form. 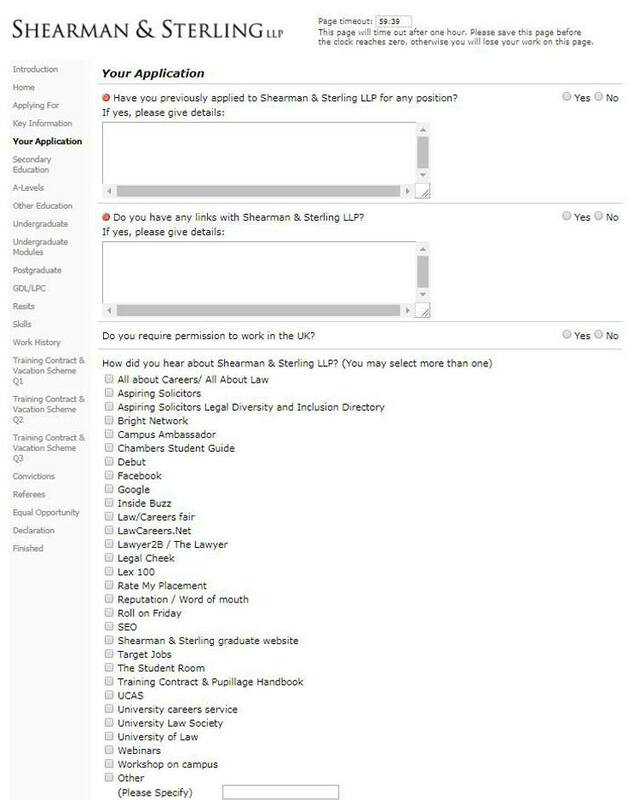 Here we want to know if you have applied to Shearman & Sterling previously. If you have applied before and have been rejected, you are welcome to apply again. There's no issue there. The key is that you have improved your training contract application and this application is better than the last. If you submit the same application, it's likely that you will be rejected again. It's in this section that you list your GCSEs. Although not commonly listed as part of the minimum academic criteria, law firms will still be interested to know how you performed. Tip: Don't make any spelling mistakes in this section. Many candidates complete this section quickly, but then fail to proofread it. It's very easy to mistype 'Geography' or 'Literature' if you are typing quickly. If you haven't studied GCSEs, you can still complete this section. 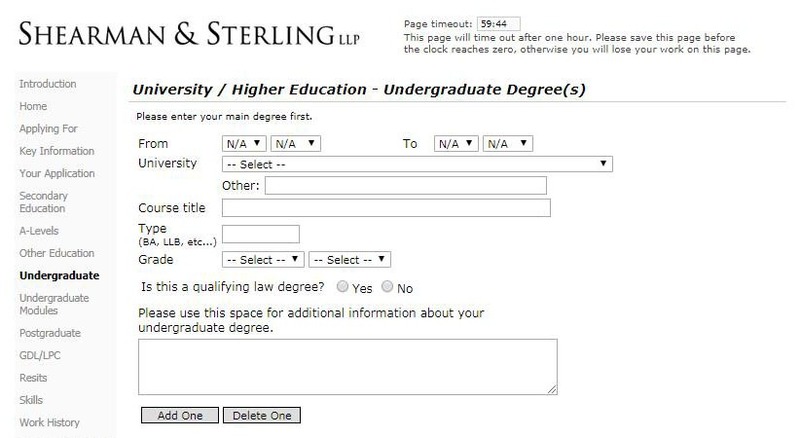 Under 'Level' simply select the drop-down option, choose 'other' and then you can free type the qualification you have studied. Similar to the GCSE section, simply enter your A-level information. 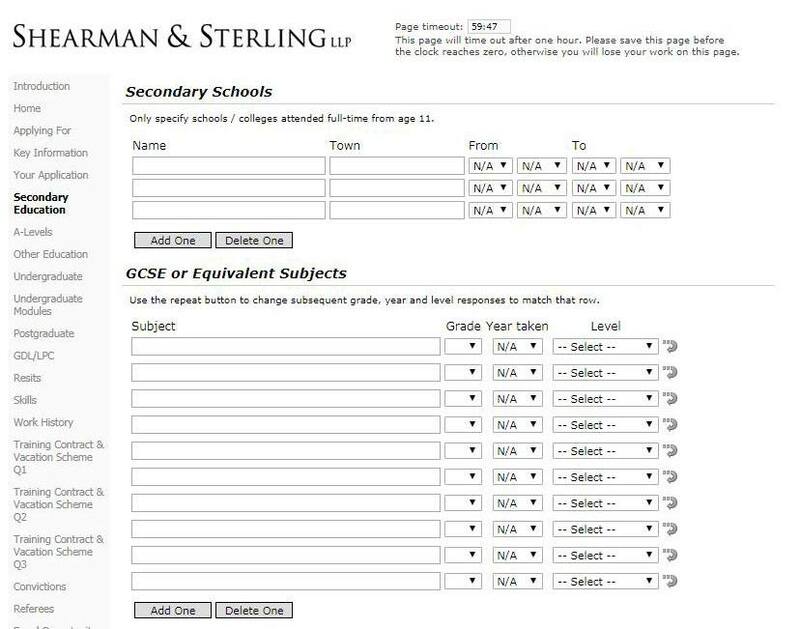 A similar drop-down option exists under 'Level' if you haven't studied A-Levels. Tip: As the UCAS Tariff changed in 2017, you should calculate your tariff based on your grades at the time you completed your A-levels. If you studied outside the UK, this is the section where you can provide us with more information. Inform us, if possible, of the equivalence of this score to A-levels. As your degree grade is a key criterion for most law firms, it's important that you complete this section well. Tip: Make sure that you are correctly selecting your degree grade as predicted or gained. You should only be selecting gained if you have graduated and have received your final result. Additionally, if all your module grades show you are predicted a 2.1, it will look odd if you predict yourself a 1st. 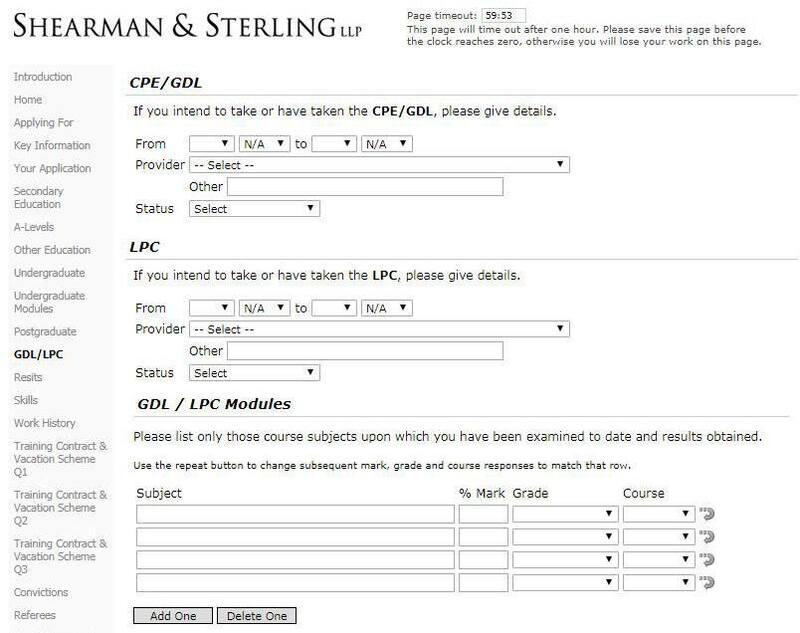 Law firms will, in most situations, expect to see a full breakdown of your modules and the grades for each. You don't have to include modules you haven't yet studied. This is a simple section for you to complete if you have studied, or are currently studying, a postgraduate qualification. Tip: Law firms tend to place more value on your undergraduate degree result rather than postgraduate study. This isn't to say that postgraduate study isn't valuable, but it's important for applicants to understand how these qualifications are ranked in the eyes of a law firm. If you are studying the GDL or LPC, or have completed either of these professional qualifications, please enter the details in this section. Again, law firms will expect to see a module breakdown. Tip: Some modules are highly regarded by law firms as the knowledge can underpin much of the work the law firm carries out. Contract law and tort law tend to be the two most important. Therefore it's important to maximise your grades in these subjects. 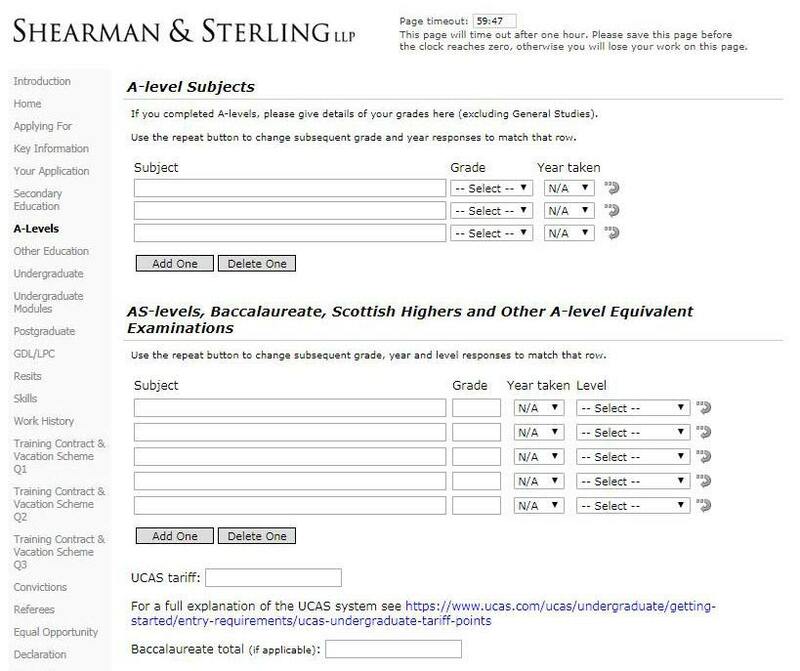 This is the section in the application where you can inform us if you have a mitigating reason why you didn't perform to your potential at any stage of your education. Law firms will evaluate this section and take into account any circumstances you list. If you are multi-lingual, here's your chance to tell us. This is one of the most important sections on the application. Law firms will be looking to understand your work experience to date, to see what work you have been exposed to and to get an idea of the skills that you have developed which can be applicable to life in practice. You can add as many work experience entries as you like, so don't leave out pieces of work experience. It's best to give a law firm a full understanding of your work history. Many candidates dismiss the work they have done as being 'not relevant'. This is often far from the case with most jobs being relevant in some way. Think about transferable skills. Tip: Fully complete the 'details' section here rather than simply adding a few vague bullet points. 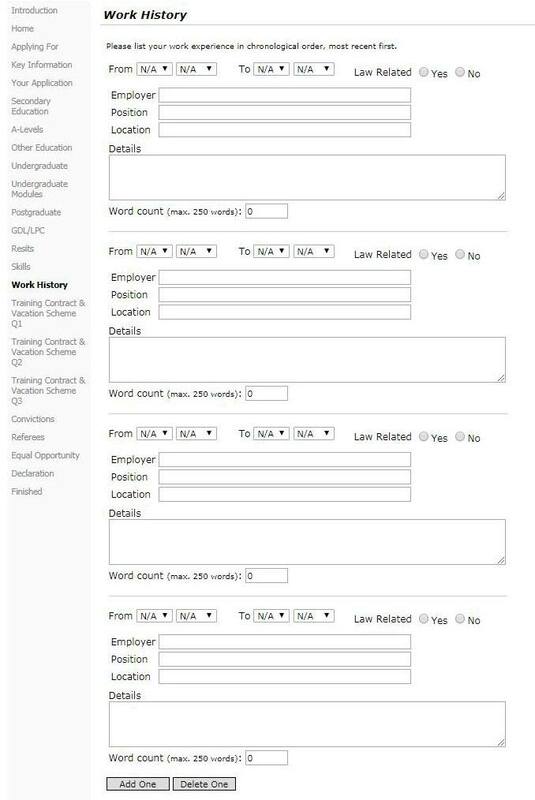 Try to write a paragraph for each work experience entry. 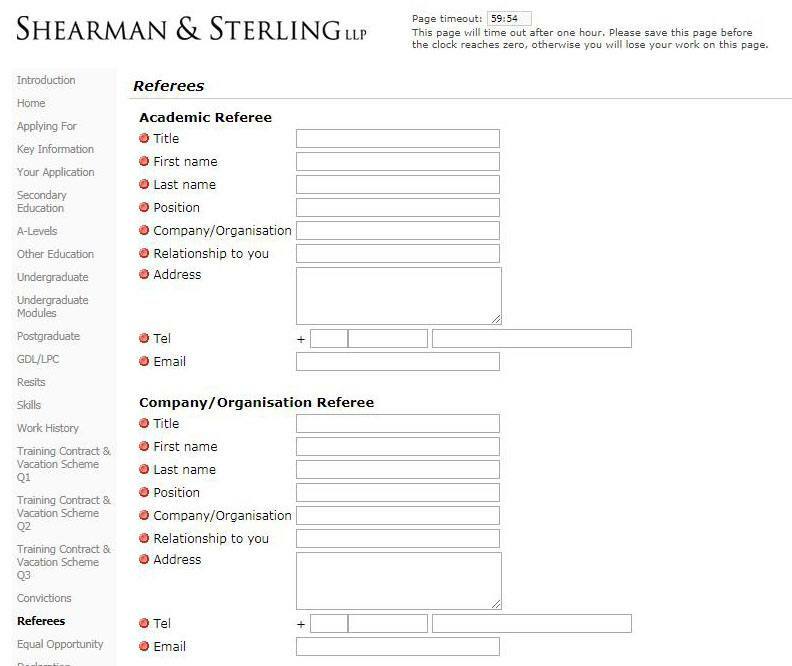 As one of only a handful of elite, international law firms, how do you think Shearman & Sterling LLP maintains its competitive advantage? 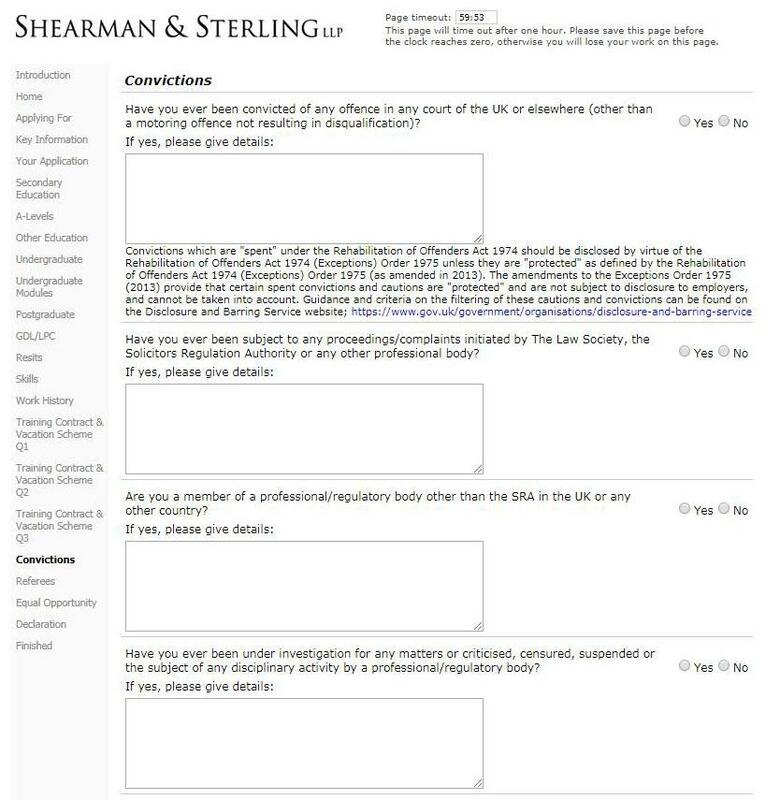 Please use this space to explain your interest in pursuing a legal career at a city law firm, and your interest in Shearman & Sterling LLP. Please include activities, interests and positions of responsibility, whether at school, university or otherwise. Each of these questions has a 250 word limit. Always try to maximise your word count using clear and concise sentences. 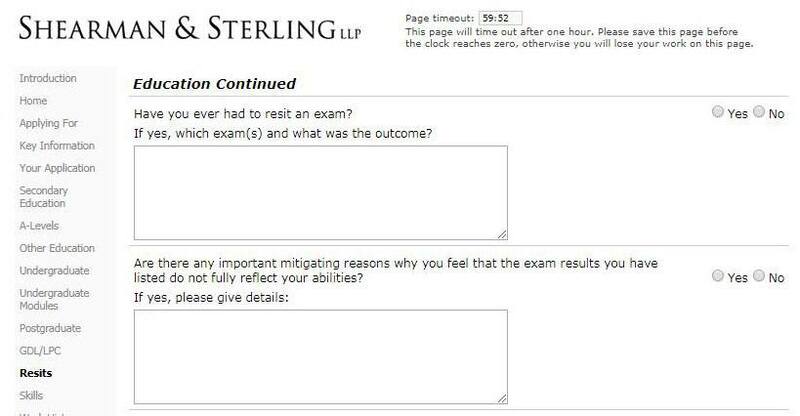 Tip: Candidates sometimes think there is a correct 'answer' to these questions - like an exam. There isn't. Law firms are looking for individual responses which show evidence of research and analytical thought. It's important for law firms to know about any convictions you have. It's always best to be honest when completing this section. You are asked to provide an academic reference and an employment reference. Law firms will have different policies on this, but most won't contact your referees until you are much further down the recruitment process. 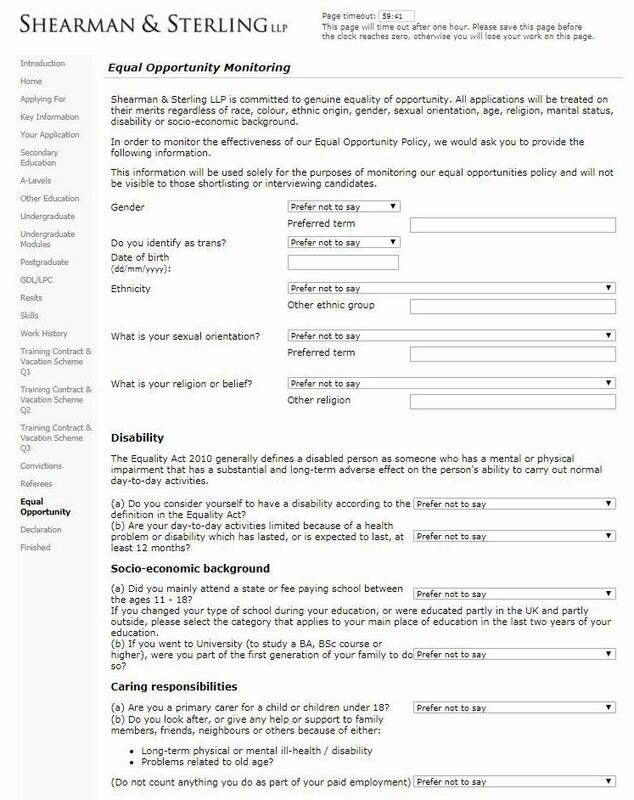 The final part of the training contract application form is an equal opportunities section. This information is not given to the law firm you are applying to. These are the 16 steps to complete a Vacation Scheme or Training Contract application through Apply4law. Many of the sections will be easy to complete, but some are vital to the success of your application, which will require a lot of time and dedication. It is the work experience section and the open text questions where candidates can really stand out. These sections present candidates with the opportunity to demonstrate knowledge, experience and skills. It's also important to remember that your online application form doesn't get you a Vacation Scheme or a Training Contract. A good application will get you to the next stage in the process - typically a first stage interview. This is important because the numbers surrounding Vacation Scheme and Training Contract applications can be daunting (I'm sure we've all seen the articles stating there are 200 applications per Training Contract vacancy). When submitting applications forms, it's important to understand that if you are in the top 5-10% of candidates, this will move you to the next stage. The application stage is often the hardest hurdle to get over as an applicant. Once you get past this stage, the numbers are much more in your favour!